Born in 1930 in Malo-Les-Bains, France, Claude was a ski instructor, gym teacher and high level competition swimmer before boarding the Calypso. 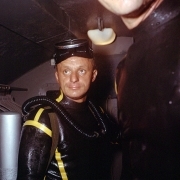 In 1955 he observed people scuba-diving in the lake of Annessy and decided to try for himself. At the time, recalls Claude, they had no wetsuits and dove in sweatshirts. - Listen Claude, the team is unanimous. Will you stay with us? asked JYC. - I am really interested, but I already have career plans in skiing and physical education... I want to become an inspector for the ministry of youth and sports. - But I know this already! - I'd like to discuss it with my family. - So Claude? He asked.